Administrators are able to assign faculty members to faculty classifications. Faculty classifications are used to collect information from faculty members at their institution. 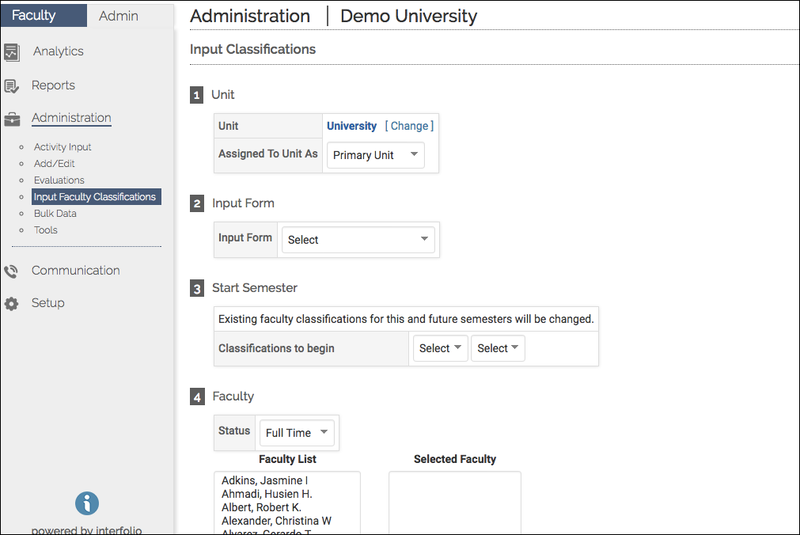 Faculty classifications can be assigned to a specific input form based on the unit and academic term. From the Admin section, on the navigation bar, click Administration. Click Input Classifications in the Input Faculty Classifications section. The Input Classifications screen displays. Select the unit, input form, and academic term to assign the input classifications. Use the Faculty section to select the faculty members for which the input classifications are applicable. In the Input Option section, click Multiple or Individual, depending on if you wish to view the faculty member's activity. The Set Faculty Classifications screen displays. Depending on the input option and input form selected, the options available in this screen will differ. When you are finished, submit the information.